Computer software training is provided to campus employees to assist with learning software supported by the Division of IT on campus-owned computers. Training is available in class setting, one-on-one, on demand video, and written documentation. For examples of trainings provided, see attached file "Training Class Catalog"
Accessibility: Learn what Accessibility is, your role and responsibility and how to create accessible documents in Word, PowerPoint and Adobe Acrobat. 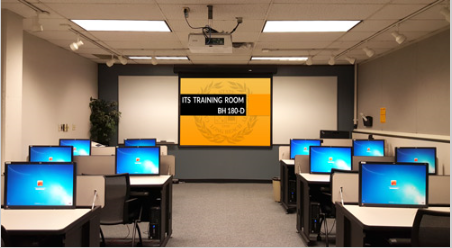 The ITS Training Room facility, Room 180-D, is located in Brotman Hall, Room 188. 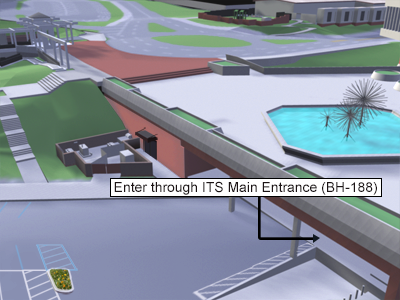 Enter from the first floor of Brotman Hall, Room 188 or from the rear parking lot through the double glass doors marked "Telecommunications/Network Services" (see campus map). No food or drinks allowed in the ITS Training Room. No materials supplied. Please bring your own whiteboard markers, pens/pencils, paper, tissue, etc. Advanced notice (at least two weeks) is required for reserving the room. All software installations must be approved by the ITS Training Room manager and must be received at least three weeks prior to the reservation. You must provide proof of licensing and we computer settings cannot be changed to accommodate new software. Upon leaving, please shutdown all workstations, dispose of trash, straighten chairs, turn off projector and lights and lock the door behind you. The person making the reservation shall be responsible for damage to the room, furniture or equipment. Check out this service request I found in the CSULB service catalog. https://csulb.teamdynamix.com/TDClient/Requests/ServiceDet?ID=28770 Employee Computer Software Training For campus employees to assist with learning software that is supported by the Division of IT on campus-owned computers.